One of the wonderful thing about being an author in this time is the Internet which allows us to have “friends” around the world. Mary Hawkins and I met on the “net” in the mid-90’s when we were helping get Faith, Hope & Love the inspirational romance chapter of Romance Writers of America started. I have always found Mary a delight. “A strong woman. My mum. Two more children were born and, over all the ups and downs of making the farm prosper, she worked hard side by side with her husband ploughing, reaping, caring for the animals. Most of all her love for her husband, their four children and her Lord never faltered. The children learnt about faith in God from the moment they were born – in fact even while in the womb through all those early, difficult days she prayed for each child. Then tragedy struck. A widow at thirty-nine years old there was only the eldest boy just eighteen to help her run the farm, a daughter in senior High School, another daughter and the youngest just turned ten at school. Death duties simply left very little money to survive. She took all kinds of menial jobs for the family to manage during the next few difficult years that followed but her children hardly knew until years later just how poor they were. Over the years as her children became adults, she wept with them when they wept, rejoiced with them when they rejoiced and just kept on praying for them and her grandchildren until the day she died last year at the age of ninety-two years. Today all four of her children love the Lord and I am so proud of that strong, beautiful and loving woman who was my mother. She showed and taught me so much about the joy and peace that can only truly come from a life lived as the Christ of the Cross would have us live. A favourite question readers like to ask of authors is “are your characters based on real people?” My immediate response is usually “no” but over the years I am realising more and more that we can only portray authentic characters from “real” people that we have met or known intimately over the years. Sure, the settings may be different, their appearance different, but sometimes people we know do creep into our stories. Without deliberately doing so, somehow over the years my dear mother’s nature has crept into some of my books. My first Heartsong Presents, Search For Tomorrow, is set in the farming area I grew up in. The hero’s mother is a widow with a strong faith. She teaches the heroine to cook as my mother tried to teach me. After I had finished writing it, I realised somehow Mum’s faith had crept also into this recent book just released in America, Return to Baragula. She is mirrored in the reaction of the heroine’s mother to her daughter’s crisis of faith. I am just so thankful I never experienced what Emily did after the wrong choice she made as a teenager that so hurt her mother, but if I had I know Mum would still have cried for and with me – even as she told me what she thought about my actions! I still have many of Mum’s favourite recipes. One she made very regularly was an economical, quick, easy and nutritious biscuit – or cookie in U.S.A. language! ANZAC biscuits are even for sale now days in our shops here. Although they are no where near as moist or tasty as Mum’s, each time I see them there – or make them myself – I remember my mother. Great for your summer or my winter here Downunder to pack for a picnic, something to nibble on a walk in the sunshine or to munch on while reading your favourite book. Add to melted ingredients, stir and quickly pour over dry ingredients. Mix thoroughly and put a teaspoon full on a greased tray. Press with a floured fork and cook in moderate oven until golden brown. Return to Baragula is an Australian story of love, forgiveness and a past that threatens to destroy it all. It is Mary’s 17th title but first by an Australian publisher, Ark House Press. Book One in her Baragula series, it was released in Australia in 2008 but not available to shops in the U.S. until this month. 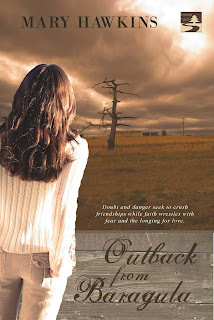 Book Two, Outback From Baragula, was also released to shops in Australasia, March 2009, but so far only available in America through the publisher. However, if you can be in Denver September 19th and visit the booksigning at the American Christian Fiction Writers‘ Conference, you might just be able to get a copy there and have it signed by Mary! Currently she is working hard to try and finish Book Three, Justice at Baragula, before her trip overseas. Crisco is all vegetable shortning similar to lard. And Edna, I'm going to include your recipe in the Yummy Recipes booklet. And I love the 500 F oven till the smoke alarm goes off. Great detail. You have the heart of a writer. Love your comment, Edna – especially that fire alarm telling you they are cooked! However, can you tell me what "chrisco" is? When trying to choose a recipe I tried to be careful it had ingedients known overseas but an Aussie has told me some may not know what golden syrup is! Just in case:- it is from sugar cane in the white sugar making process. First there is treacle, than golden sryup a little more refined,then brown sugar of various brown colours before that yummy white stuff! So many times when I read lovely sounding recipes from overseas I either haven't a clue what an ingredient is or can't find it in our shops! Thanks, Sharon. Yes, the older I become myself I think the more I appreciate just how strong and brave Mum was. After Dad died she had to change from the "shy girl from the bush" that she really was to a woman standing up to lawyers, bank managers and a couple of guys in business who tried to mess with her. Great blog, Mary. Your mum was an amazing woman and her story is a reminder of just how hard "the good old days" were.